Luma Comfort IM200W Portable Ice MakerIf you are in need of ice to serve your guest's chilled beverages and fizzy drinks on special occasions and are looking for compact and portable equipment that will help you arranging extra ice, then Luma Comfort IM200W Portable Ice Maker perfectly suits your requirements. This portable ice maker can make up to 28lbs of ice per day. The icemaker is stylish in looks, compact in size and is highly portable which means you can carry it easily for your outdoor activities. 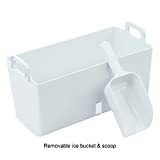 The ice maker is designed to manufacture large capacity of ice quickly and easily. Moreover, the ice made in the ice maker is clear and is of restaurant quality.Advanced TechnologyThe Luma ice-maker uses advanced technology for making ice that clear in looks which make it great for cocktails and beverages in parties. The ice made by the ice-make melts five times less than that of cloudy ice which makes it ideal for individuals that enjoy entertaining.Stylish and AttractiveThe Luma ice making machine is not only attractive in looks but also is efficient when it comes to functionality. The stylish looks of the ice-maker blend easily with home bar decor or kitchen while being a perfect party mate. 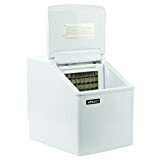 The ice-maker makes large quantities of crystal clear ice which prevents you from making trips to superstore before every gathering.Compact and ConvenientThe compact size of the ice-maker helps in accommodating the unit easily in any corner of the bar or on the kitchen top. The freestanding model of the unit frees you from worries of installation. The user-friendly design of the ice-maker is easy to operate and just needs to be plugged-in to start using. 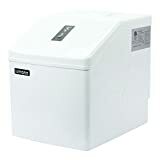 Interested in the Luma Comfort IM200W Ice Maker 28 Pound White? Is the price too high? 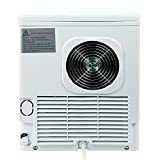 You can easily price watch this product and we'll notify you when the price reaches your target.